Stade Francais winger Josaia Raisuqe was sent off but the French champions still easily beat Munster in their Champions Cup match in Paris. Raisuqe was sent off on the stroke of half-time for gouging Munster's CJ Stander as they wrestled for the ball. Paul Williams, Sekou Macalou and Hugo Bonneval crossed for Stade who are four points behind pool leaders Leicester. A late Conor Murray try prevented Munster suffering their first shut-out in 21 years of European rugby. The Irish side are now out of the Champions Cup - barring a miracle series of results - after suffering three pool defeats in a row for the first time. Munster were dealt a series of early blows with the loss of tight-head prop BJ Botha and full-back Andrew Conway through injury. The opening try on 32 minutes stemmed from a burst by Waisea Nayacalevu, which led to Williams picking his angle between forwards Dave Kilcoyne and Dave Foley to score under the posts. Morne Steyn converted and added a penalty for a 10-0 lead. Munster then lost Tommy O'Donnell despite the flanker initially returning from a head injury assessment. 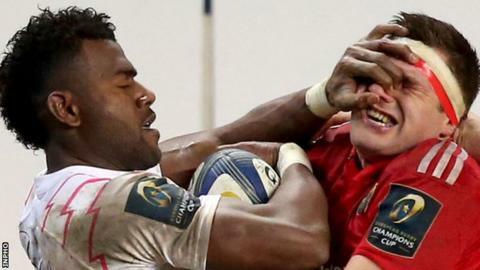 Stade were reduced to 14 men when Raisuqe was shown by replays on the stadium's giant screens to have put his hand in Stander's eye as they wrestled for the ball after World Cup final referee Nigel Owens had blown the whistle. Steyn added a second penalty before Munster saw Rory Scannell's try ruled out for a forward pass. Stade Francais flanker Macalou then tore clear for a try before full-back Bonneval beat Simon Zebo to score a third, although the Munster full-back combined with Scannell to create Murray's consolation effort with five minutes remaining. Stade Francais: Bonneval, Arias, Nayacalevu, Williams, Raisuqe, Steyn, Dupuy, Taulafo, Sempere, Alo-Emile, Pyle, Gabrillagues, Macalou, Nicolas, Parisse. Replacements: Plisson for Bonneval (72), Danty for Arias (50), Tomas for Dupuy (70), van der Merwe for Taulafo (52), Panis for Sempere (47), Slimani for Alo-Emile (46), Mostert for Gabrillagues (72). Munster: Conway, Earls, Saili, R. Scannell, Zebo, Keatley, Murray, Kilcoyne, Sherry, Botha, Foley, Chisholm, Copeland, O'Donnell, Stander. Replacements: N. Scannell for Sherry (68), Sagario for Botha (57), B. Holland for Chisholm (78). Not used: J. Ryan, O'Donoghue, O'Leary, Hurley, R. O'Mahony.